As with the case of the picture-winged fly, this is one of those small arthropods that are so common and humble, I’ve never bothered to learn about them. But now I’m glad to have looked them up! 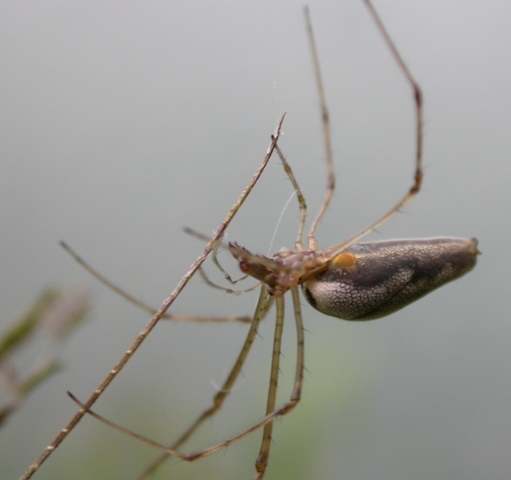 So today I’d like to introduce you to Tetragnatha! I’m pretty sure the species is T. elongata (though I’m not ruling out the similar T. extensa—apparently there’s a lot of variability in the drab coloration and patterning in both species). Also, the photos on this post show three different individual Tegragnathans, and they might not all be the same species, anyway. Pronunciation: Do you suppose it’s pronounced TET-rag-NATH-ah, or TET-rah-NATH-ah? Gnathos is the Greek word for “jaw,” and I gather the g is silent—but then I was taught that the group of “jawless fishes” (including the lampreys), Agnatha, is pronounced “ag-NATH-ah,” with a hard g. If anyone knows how to say this, please chime in! Some folks call these “stretch spiders,” because when at rest, or when frightened, they strike a uniquely “elongated” or “extended” pose, with the two long, skinny front legs stretched straight out before them, and the hindmost pair stretched behind. With their drab tan or gray costumes and narrow bodies, they look like an insignificant little twig or piece of grass. 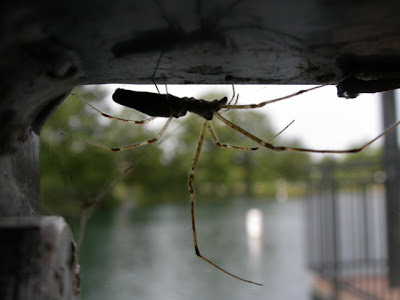 The third pair of legs are shorter than the other pairs, and these are used to grasp whatever they’re resting on—a cattail blade, the underside of a dock railing, or their web. Now, most spiders that spin orb webs (you know—those beautiful, intricate wheels of gossamer to net their prey with) make them “vertical”—they’re upright, like the wheel of your car, when it’s on your car. 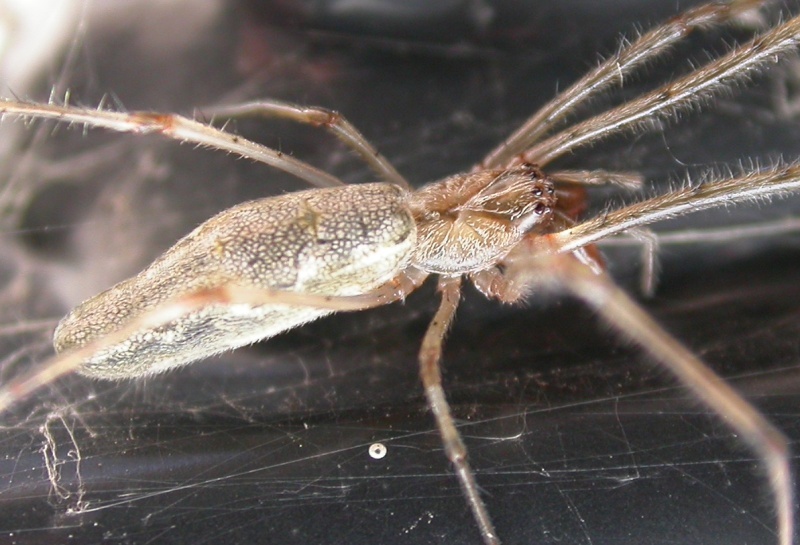 Well, Tetragnatha seems to usually spin its web horizontally—parallel to the ground—like a tractor tire that’s being used as the boundary of a child’s sandbox. 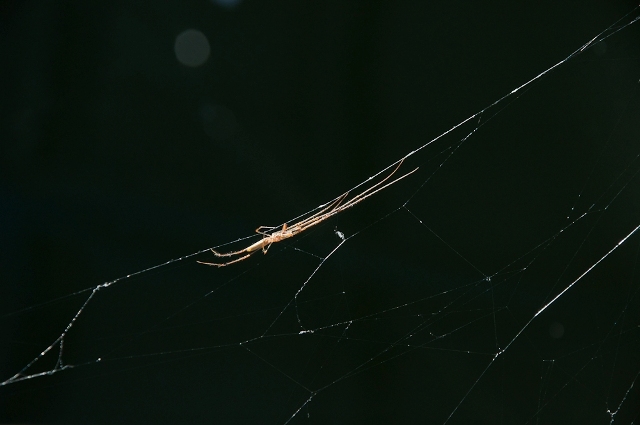 But Tetragnatha’s web is not usually positioned over the ground. 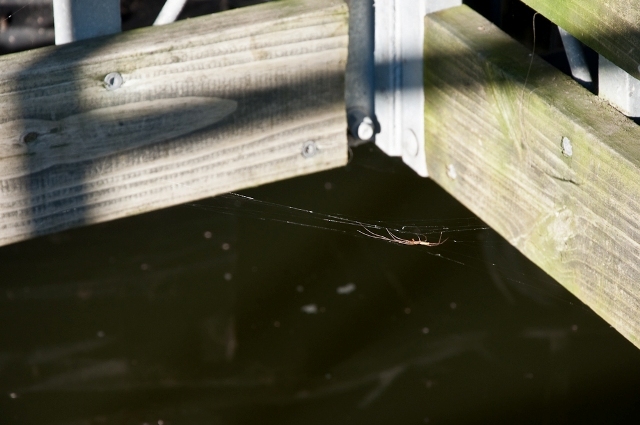 You’ll find their webs most often over water—lakes, ponds, streams. I see them commonly on the edges of docks, where a right-angle bend makes a nice V-shaped nook for them to build in. 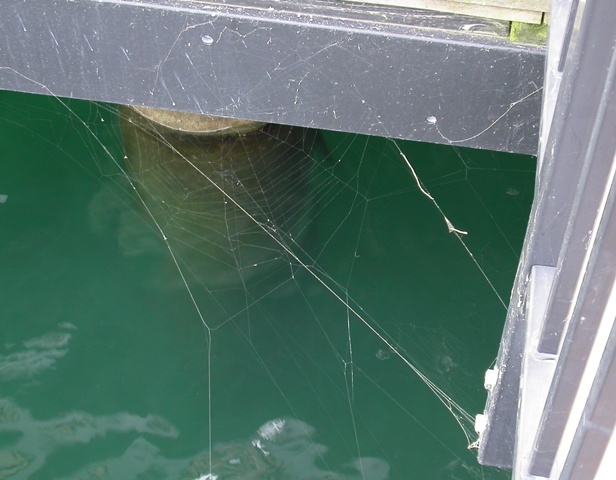 Now, why in the world do they position their webs like this? Are they trying to catch jumping minnows—? No. At this point, it’s time to talk about the life history of the mayfly! 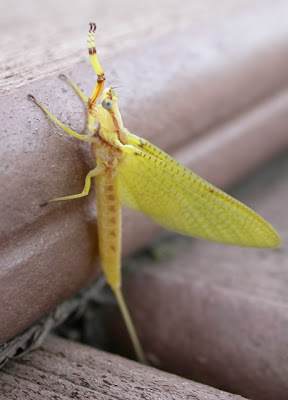 Mayflies, like many insects, undergo metamorphosis from unwinged juveniles to winged adults. And the juveniles of mayflies (and dragonflies, too) are aquatic. 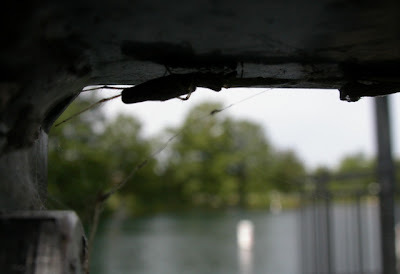 Without the wings, they are odd-looking armored, legged insects with antennae-like “tails” that creep around on the bottoms of lakes and ponds, acting like “bottom feeders,” for the months and even years it takes for them to mature. 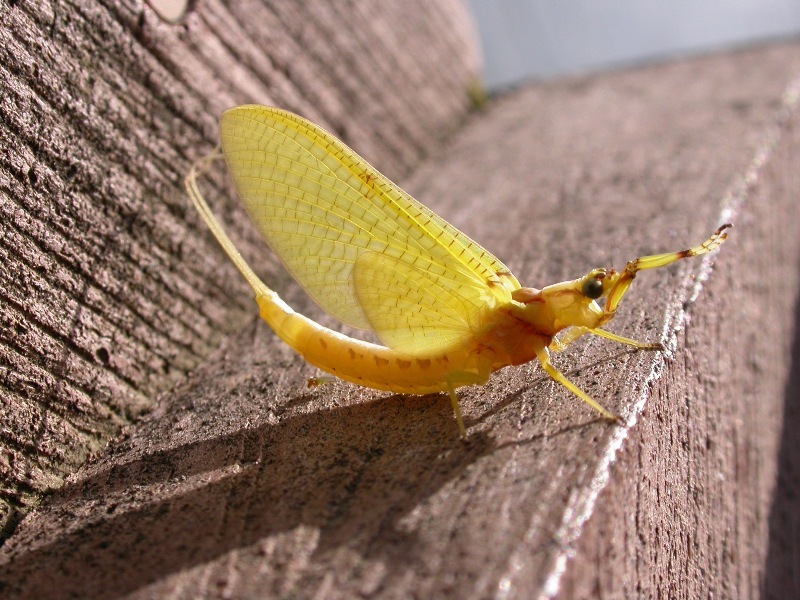 So the mayflies say goodbye to their murky aquatic existence, crawl out of the water, and transform into their equivalent of “butterflies”—delicate insects capable of flying through the bright, clear air. 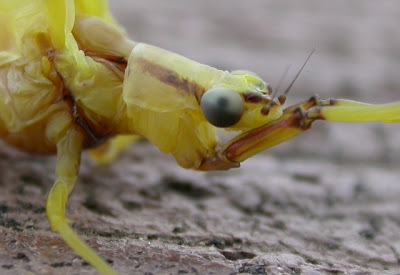 It’s just like when cicadas emerge from years of living in the soil to be reborn as glorious flying, singing creatures. But right over the spot where the mayfly’s wings are just now hardening, in the morning sun, into the machinery of flight, guess who’s cast her big hunting net? Yep. Tetragnatha. The mayfly opens its wings a few times, stretching its newly discovered flying muscles, then leaps into the air for its very first flight . 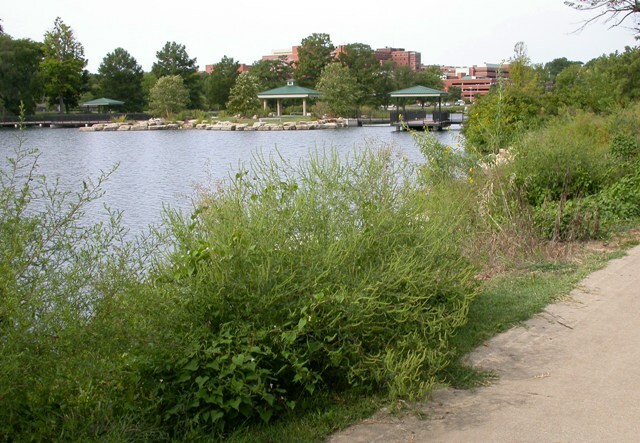 . .
Now, now—don’t be crying over the mayflies! They are famously numerous, sometimes occurring in swarms. Some people absolutely despise them and the greasy mess their swarms make. In their adult form, mayflies are also famously short-lived (the name of their order is Ephemeroptera—the ephermeral insects). And anyway, if you eat meat and eggs, then you can’t talk—cows, pigs, chickens, lambs, all have more “going on upstairs” than the pin-headed mayfly. By the way, another common name for spiders in this family is “long-jawed orb weaver.” The genus name Tetragnatha itself means “four-jawed spider”—which although literally untrue (they have just two fangs like all the other spiders), does colorfully describe the fact that the fangs are much longer than those of many other spiders! In taking my pictures, I didn’t go so far as to harass (much less kill) any of these spiders just to show you the full extent of their unfolded fangs (chelicerae—chuh-LISS-er-ee)—but if you search the “Web” (ha ha) for pictures, you’ll find close-ups of the face, of the fangs, and even of the fangs “in action”: When a male and female Tetragnatha “get together,” they lock chelicerae. They, too, are “pin-headed.” The nice long “arms” of the fangs hold off the hungry female, preventing her from devouring the male before his “mission” is complete. Sooooo . . . the next time you’re on a dock, or walking along the edge of a lake hunting for a nice fishin’ spot, or even taking a walk to the “island” at Columbia’s wonderful Stephens Lake Park (where many of these pictures were taken), keep an eye out for skinny little Tetragnatha, and greet her by name. Great photos and a great read! I enjoyed learning more about this spider and the mayflies as well! Thanks for sharing this info! Thanks, Gretchen, for your kind comment. 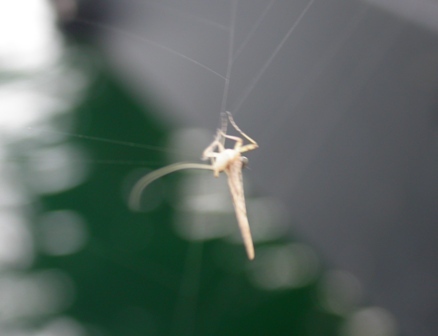 I might have gotten better pictures of the spider on the railing if I had poked and prodded her, but I found her on a chilly morning after a day of rain, so I decided to give her a break! 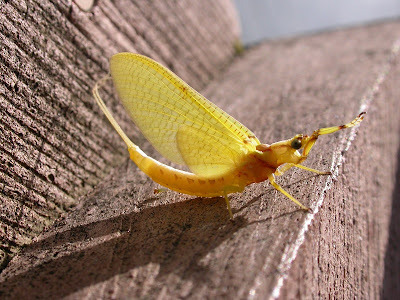 On mayflies: you might enjoy a recent post I did on the natural history writer Edwin Way Teale and his book "Journey into Summer." In it he describes the huge swarms of mayflies over Lake Erie in northern Ohio--an annual event. Here's the URL: http://opulentopossum.blogspot.com/2011/07/edwin-way-teales-journey-into-summer.html.